Did you know that peeps are basically indestructible? Not water, nor powerful acids, nor powerful bases dissolve them. That’s one tough little tweeter! Peeps have been the #1 non-chocolate easter candy for over 20 years. In 1953, it took 27 hours to make a peep because of time-consuming details like hand-painted eyes. 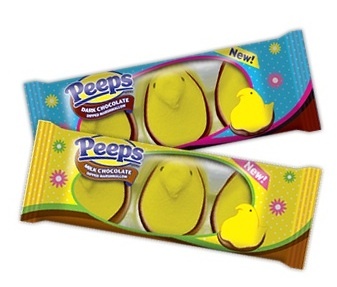 Today, it takes 6 minutes to make a peep. 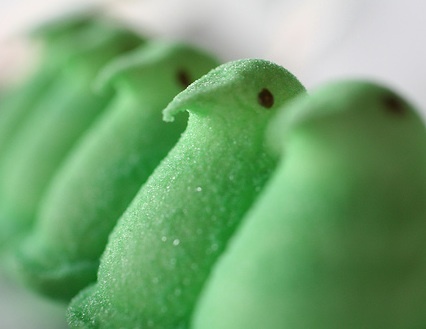 The leading peep-eating champion ate 102 peeps in 30 minutes. The leading speed-eating champ ate 7 peeps in 30 seconds. The main colors of peeps in order of popularity are yellow, pink, lavender, and white. Peeps have a shelf life of 2 years. thanks! Our family is big on Peeps!! Peeps, such a classic! My kids love them and I loved learning about their “history”! In honor of Easter yesterday, may you really know how America’s favorite marshmallow bird is made. Never heard of these little devils. So, can you chew them? Do they just pass right through? Why would anybody ever EAT them? It’s not Easter without peeps! What on earth are they?!! They look like sugary Easter chicks but they don’t sound much like that ;) Never seen or heard of “peeps” before but fascinating to discover such strange delicacies exist! Because no Easter would be complete without (indestructible) Peeps. Sounds like peeps and McDonald’s french fries might be second cousins. Aha! But place in the microwave and voila! Peep Carnage!! They don’t dissolve? ? Another reason I refuse to eat the nasty NASTY THINGS!!!! Reblogged this on Clown Town for Kids. Nice post! It’s that time of year again, isn’t it? Peeps … never heard of or seen. Not to sure I would like neither. You have some wired things over there .. and you sure have some great things too. They now come in many colors and chocolate dipped. Weird things – I’ve never seen them before.